Face painting is a great addition to a lunchtime or evening session. It lifts people’s mood and brings in regular business. Children are happy and busy as they choose their design, watch the face painter and make new friends with other children. When they return to their family, everyone smiles and the overall experience at your venue is instantly enhanced. This can improve your venue’s reputation and takings. 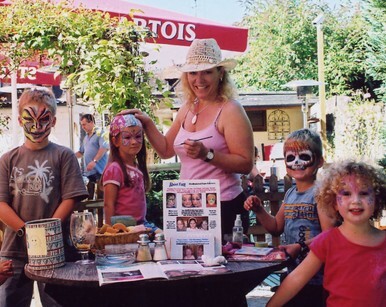 Customers may repeatedly return to your venue because of the provision of for example, the Sunday afternoon face painting session. The regularity and frequency of the session allows parents to plan for their visit and children will ask to come back. A face and body artist can enhance a private event, drinks launch, family day or themed party at your venue. Our experience is that ongoing promotion continues by word of mouth and from the customer’s photographs of their children, or from the private event. The painted faces work as advertising for your venue and can increase the walk-in business on the day itself.